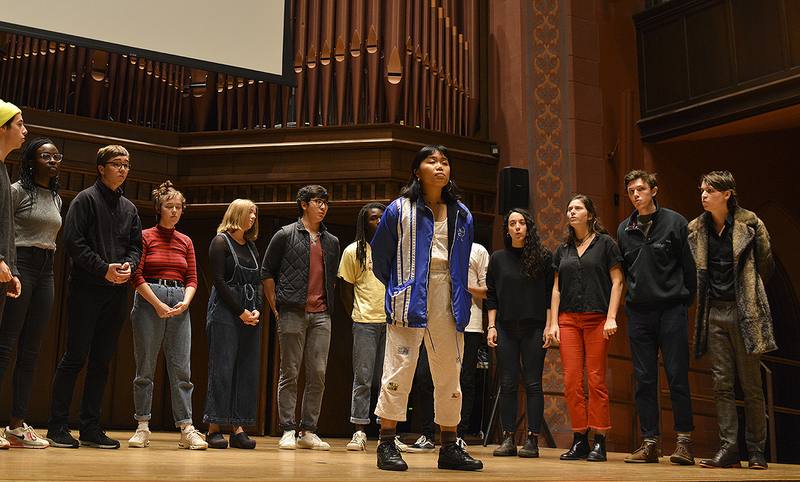 On Sunday, Sept. 2, the University’s a cappella groups held their yearly performance showcase to introduce the first years to the collegiate tradition of singing in libraries. A cappella has enjoyed a recent surge in popularity with the success of the “Pitch Perfect” franchise, and certain groups have achieved an almost cult-like level of devotion to their craft. The Wesleyan Spirits, the university’s oldest (formerly) all-male a cappella group, performs the most traditional repertoire of fight songs and fraternity favorites, but has been known to shake up their solos (such as when they covered Smash Mouth’s “All Star” at their 2017 Spring Jam). Last year, the Spirits opened up their auditions to include members of any gender, as long as they have a range between tenor and bass. Griffin Barich ’20 has been a Spirit since his freshman year, and considers the group to be some of his closest friends. For many, a cappella at the University offers a chance to make lifelong bonds. Torie Davids ’18 performed in both Slavei and Notably Sharp during her time at the University, and found fast friends in a cappella as a junior transfer. Although she recently graduated, Davids has made sure to keep in touch with the group. Notably Sharp is a co-ed a cappella group, of which there are many on campus. Davids was surprised by the lack of competition between other a cappella groups—everyone generally made an effort to be supportive of each other. The University’s oldest a cappella group, the Cardinal Sinners, also happens to be one of the few all-women groups on campus. Some of the members, including Zoë Kaplan ’20, resent the comparisons to sorority life. For those intimidated by strong a cappella fervor, plenty of singers have found a healthy balance between their singing groups and other areas of interest. Sam Petersen ’20, the Spirits’ music director, has learned to take a step back from the group when he feels overwhelmed. Connor Bennion ’18 is often considered by his friends to be the “Daddy of A cappella.” He has performed in a cappella groups at the University for six years, and spent four summers as a member of the Vineyard Sound, a professional a cappella group based in Martha’s Vineyard. Towards the end of his career, he began music directing for both groups. Many of his a cappella-mates admire him for his natural musical ear and his booming, room-filling voice. Bennion’s older brother also attended the University six years before him, giving Bennion 10 years of collective history of University a cappella. Bennion noted that over his time at the University, the demographic of a cappella singers also shifted. When he first started, more athletes had the free time to participate in non-athletic extracurriculars like a cappella, whereas now there is more overlap between the a cappella and the active student theater community. Additionally, Bennion credited the popularity of a cappella-related media to the new personalities in the scene. Regardless of the size of your ego, range, or tuning fork, a cappella has become a home for many members of the University community.